"Sharp, very independent, determined, confident, very real and honest." Stephanie Allen is describing the traits of her star sign, Sagittarius, and over the course of our conversation it becomes clear she embodies every single one of them. 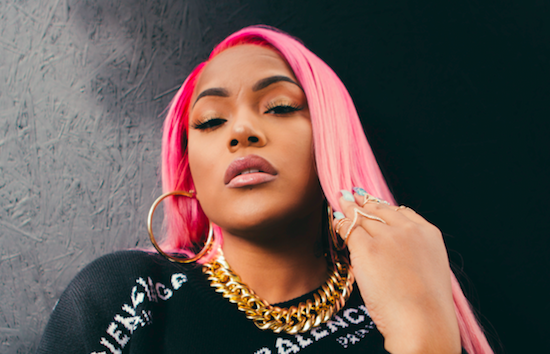 Indeed, you get the impression that in pretty much any given situation, Steph - known to most as vibrant rising rapper and singer Stefflon Don - stands out with said unapologetic confidence. When I meet her she's replete with fiery orange hair (a change from her trademark blue), a hoodie with a diamanté zipper, and frosted in glittery accessories and equally glittering make-up. She emanates a majestic, head-turning presence, not least because of her booming laugh and the intimidating way she switches between sipping hot tea and eating ice as she talks. "Even before I was Stefflon Don, I always loved looking good,” she says through a mouthful of ice, “It makes me feel more confident - like when I used to walk on the road before, when I wasn't big in music, people used to stop me and be like 'what do you do!? Are you a model?'" It adds to a sense that Allen had long since decided she was going to be huge, and that star-like aura is oddly amplified because we’re near London Bridge, sitting in the back of low-key fast-food chain, Leon. Allen is at once warm and curious, but decidedly brief when she talks about herself – she does not ramble on or give answers longer than she deems necessary, which can be disarming at times. Possibly this is less to do with curtness, though, and more to do with her current state of being constantly on-the-go. Today she’s come straight from shooting a video, and when I ask if she got to see Spice play at Notting Hill Carnival (the two were sharing a stage), she explains how she had to miss her as she played her set before immediately taking a helicopter in order to perform at Leeds Festival a few hours later. “I’m so tired, and they keep telling me it’s only gonna get worse,” she says at one point, “I’m like, 'Oh my god!' I never sleep now as it is!” She’d like a holiday, but she’s happy enough without one for now: such is the life of a Next Big Thing, and she's not intimidated by the concept. With years of arduous work in the studio and a huge backlog of songs she has yet to release, the rapper and singer feels like she's been "ready for it" for a long time. Indeed, Allen's first work in the music industry was as a child, featuring on a track for rapper Unique - "You know that Jay Z kind of vibe on 'Hard Knock Life', where you had the kid on the hook? I was the kid on this hook." Though her musical output wasn't consistent in her youth - punctuated by moves from Birmingham, to Rotterdam, to London - she got back into the studio a few times in her teens, and by the time she was 20 and in London for good, she was dedicating herself to her music (via a phase as a hairdresser, that at one point saw her go to India looking for weave - a trip she speaks about very fondly). The UK MC broke through with her remix of Section Boyz' 'Lock Arff', and has been a talking point in the country ever since: her face has been particularly ubiquitous on posters around London in the past few months. With that said, Stefflon Don perhaps needs even less introduction to those who are into the current school of US hip hop: she featured on one of the best songs on teen rap king Lil Yachty’s poppy debut album ’Better’ earlier this year - a dreamy ode to youthful romance - and her latest potently humid single 'Hurtin' Me' featured summer favourite French Montana. At the time of writing she’s also on tour with hip hop behemoth Future (she's hoping he'll overhear her singing in a corridor at some point and want to work with her before the tour is over). Jumping on the Section Boyz track was never a plan for fame, she says: "I just loved it ['Lock Arff'], and every time I heard it or played it to someone I felt like, 'This is what I want to do, this is the vibe I want!' When I do something that I feel is really great, I don't care about the response, whoever doesn't like it - I just care about whether I love it. It's always like that - you have to love it first, cos I can't go around promoting stuff just because this is what's in right now. I still have to like it." Of course, one thing that's "in" right now is dancehall, a genre that hip hop and R&B have both pulled on heavily in the past two years. Though Stefflon Don's music is a blend of multiple genres (last year's excellent mixtape 'Real Ting' featured elements of hip hop, bouncy afrobeat, smooth R&B and boisterous grime) there's no doubting the energetic, breathless dancehall influence that has always been there - not only because of her Jamaican family, but also from her time in the Netherlands, where sub-genre "bubbling" was a favourite, and influenced her distinctive patois that occasionally blends in Dutch. She doesn't begrudge how huge the sound has become in the top 40: "I think it's cool - why not? I'm from the greatest part of the world, which is Jamaica, and everyone is on a Jamaican vibe which is dope!" Having grown-up in a mesh of cultures, she is unsurprisingly impassioned when we talk about Brexit and immigration. "No one should be frowned upon or looked down upon, or refused entry of the world. Man didn't create this world, it was created by a greater being - so I feel like everyone should have equal rights to be what they want to be, and where they want to be." At some point she says she’d like her music to address this more political side of things, but for now Allen's lyrics do largely fall into certain tropes: relationships and refreshingly in-your-face sexuality, for example, play a heavy part in her sound. "I don't believe in contaminating your art down for other people - whatever you are, that's what you are," she says, regarding whether or not - as a black female in the industry - she feels certain industry pressures to be a certain way, or - indeed - to take ownership of herself to fight back against said pressures.